I saw this poem of Erma Bombeck a few weeks after Joas was born. The beginning was hard for me. I grieved, because I didn’t get the child I wanted. I was angry with everybody, especially angry with myself. The person who wanted to be good at everything, who wanted to excel in everything. All I ever thought about in my life was ‘the next step’. How could I make things better, how could I achieve more? I was always planning my future. You have a nice job. You meet a nice guy and move in together. You get married and you get pregnant. The perfect path, the perfect picture, everything was going as planned. The pregnancy went well, I felt good, we even backpacked through Asia during my pregnancy, just the two of us. The birth itself went well. But then…. 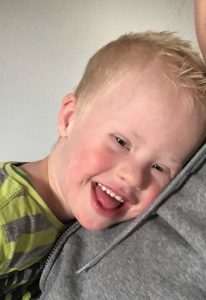 The doctor said: I have to tell you that we expect that your baby has down syndrome. BAM… nothing… I went numb.. The first six months were hard for me. How could this happen to me? What is wrong with me? I did everything right. Why am I being punished? I was very very very angry. I didn’t feel a bond between me and my baby. My perfect life wasn’t perfect anymore. But after reading the poem of Erma Bombeck, I slowly started to feel better. Slowly started to see the beautiful things. This poem really helped me through the dark days. It showed me that I was a strong woman after all. I see a lot of qualities of me in that story. Maybe I am chosen to be the mother of this beautiful child, because I can do this. I CAN DO THIS!! Yes, I am not patient. And yes I am stubborn en independent. And yes, I am selfish enough to say: I love me-time. I CAN DO THIS!! Slowly I gained more confidence in myself. And slowly I started bonding with my babyboy. Of course, during the difficult period, I was there for Joas, daily, at the hospital. But at the same time I wasn’t there, you understand? After months of sadness en being angry, I became more calm. I started to fall in love with my little monkey. My innocent little monkey. I realized that if I couldn’t be there for him, fighting, as a mother, then who would? I am the person who carried him for nine months. I talked to him in my belly for nine months. I promised to be there for him. It is not his fault. He didn’t ask for this. He is… just Joas. And he is MY SON!! I want to protect him, I want to comfort him when he is sad or ill. I want to hug him and make him laugh. I want to fight for him to make sure he will succeed in this hard society. I want to make sure he finds his passion. I want to make sure he will be happy!! And indeed, we enjoy every step he takes. We don’t take things for granted. Now I see, he makes my life more perfect. He in fact makes me, and my family, special, because he is special! Did you ever wonder how mothers of disabled children were chosen? Somehow I visualize God hovering over the earth selecting his instruments of propagation with great care and deliberation. As He observes, He instructs His angels to make notes in a giant ledger. “This one gets a son. The Patron saint…..give her Gerard. He’s used to profanity” Finally He passes a name to an angel and smiles. “Give her a disabled child”. “And what about her Patron saint?” asks the angel, his pen poised in midair.